My new construction project is running very smoothly. After passing the inspection on my house wrap Monday, we were finally able to start putting the Hardi Siding up. I have really been anxious to see what the house will finally look like after all the rough work that gets buried and nobody will see. Now comes the fun part, which actually gives the house its personality. What’s inside the walls is just as good as you guys know, but this part is what I’ll look at every day. First, I framed the windows with 1 x4″ Hardi Trim. The Hardi Lap Siding on the bottom goes up pretty fast in 12 foot lengths with a 7″ reveal, I went with the smooth version to look clean. The Hardishingle Staggered Edge style up top on the other hand, is quite labor intensive. The pieces are only 48″ wide and go up with a 6″ reveal, but really give the house some dimension and texture. I ran a 1x8″ dividing band board with a 1x2″ shelf on top to separate the styles and add even more detail. 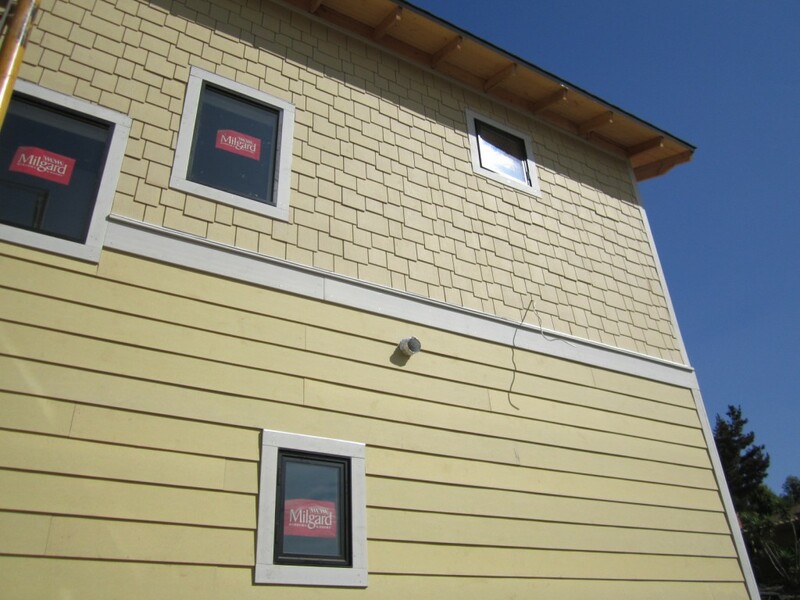 The siding comes in primer, but oddly enough the color is similar to what we will actually be using for paint. 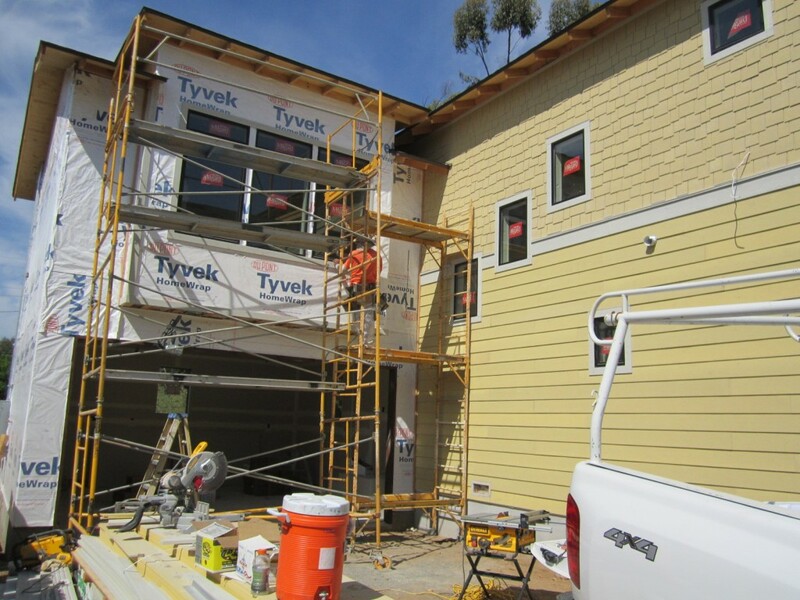 We are now on our second wall, I can see this siding project stretching out to several weeks as there is tons of detail work and not much room around the house for the scaffolding, but its looking great! 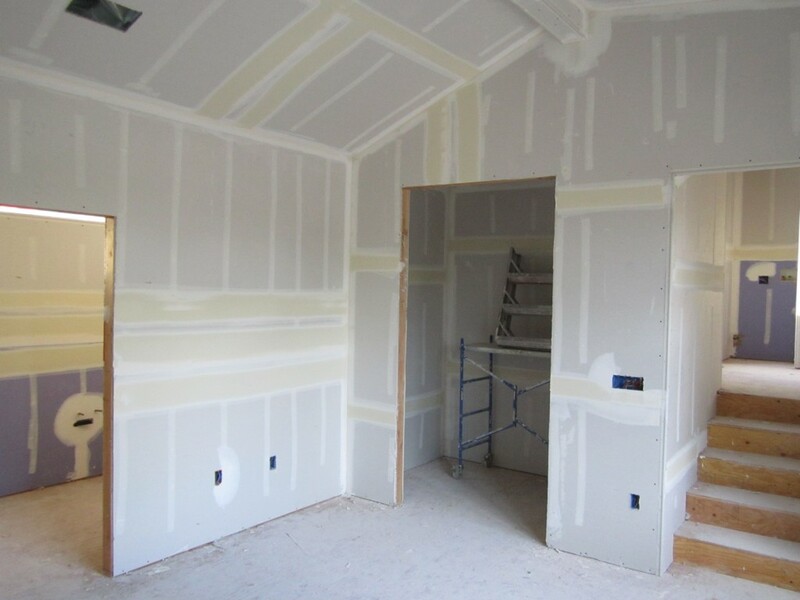 The second inspection we passed this week was on Thursday, for the drywall screw spacing. The mud crew was on standby to start taping and floating everything once the inspector signed off on the hanging job. Once again, this is an extremely specialized crew. Different guys than the drywall hangers last week. 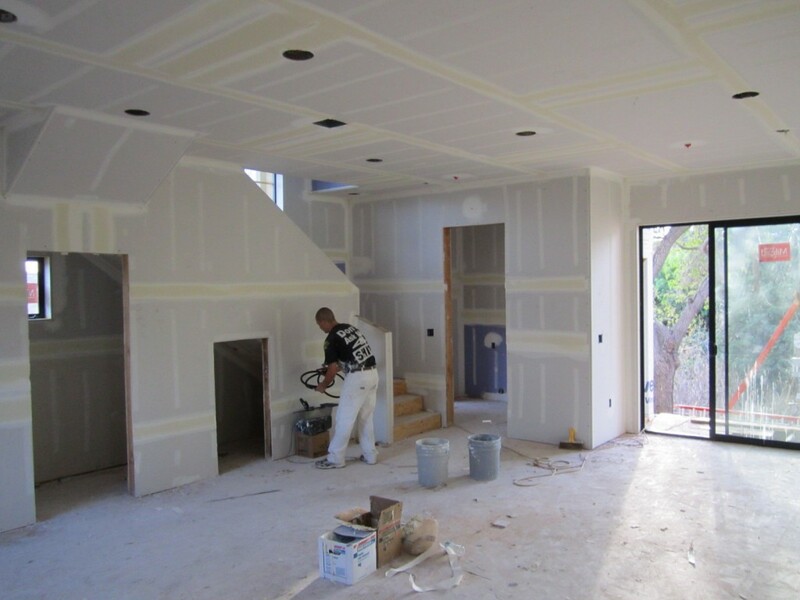 We are putting one of the best drywall crews in San Diego on this project and after the whole house is taped and floated we’ll be doing 2 coats of a level 4 smooth hand-troweled texture. In order to keep up my construction pace, I ordered all the pre-hung interior doors last week, bought the Red Oak unfinished hardwood flooring material this week, and am currently about ready to pull the trigger on the millworks package. It’s all about thinking 2 steps ahead to make sure you don’t run into a 3-week wait for a special order, which in my case is just about everything. Tom, you are a machine! This is a VERY well planned, prepared, and built home. Thanks Bill, you guys have a lot of cool stuff going on too. I want to check out Panorama and also the spec house you just broke ground on too. Curious as to why you don’t post your rehab costs and then what your net profit was on the deals? Like the MCM and Painted Lady projects….. Thanks Tara! I don’t think sharing how much we net is anyone’s business however there are some other sites that give that info. I’ll occasionally give prices for stuff but you have to remember we don’t hire a General Contractor nor do we pay top dollar sub contractor prices. Managing the project and wearing a tool belt enables me to get stuff done for way less than other investors. If I shared the numbers nobody would believe you can get stuff done for that cheap so it would be pointless. Are the neighbors getting excited yet? Jason, They’ve been pretty excited and we are getting people stopping by. Its the tale of two neighbors, one side is a homeowner who brings us beer on Saturdays and is super stoked, the other side is a rental that complains when we work long hours or on occasional Sundays. One lady even yelled from across the canyon on a weekday around noon “Hey can you guys keep it down over there!! ?” Oh yea lady sure, we’ll build this house quietly so we don’t wake up your cat. Another great house you are doing here. I feel like an inferior rehabber doing mostly paint and carpet stuff compared to what you are always doing. Thats what I love about the business, there are so many avenues. I’m really hands on with the construction though, so maybe that’s why. So stoked your blog is back up, I’ve been lurking. Thanks for cruising by! House looks great! Good job. Have one question: saw the final renderings and noticed the nice modern/contemporary garage door. Do you mind sharing what door it is and who your supplier is? The garage door is made by Amarr. Its called a full view. You can get it in many variations with color options on the aluminum and different glass as well. Any garage door supplier can special order it. Familiar with Amarr. Came across a brand called Northwestdoors a while ago. They also have nice modern garage doors. Price so far the most competitive based on my research. Difference seems to be the thickness of the frame – NW is bulkier. ..sometimes bulkier with aluminum windows and doors is better because you get more of the commercial look. I’ll check out that brand, thanks for the tip.